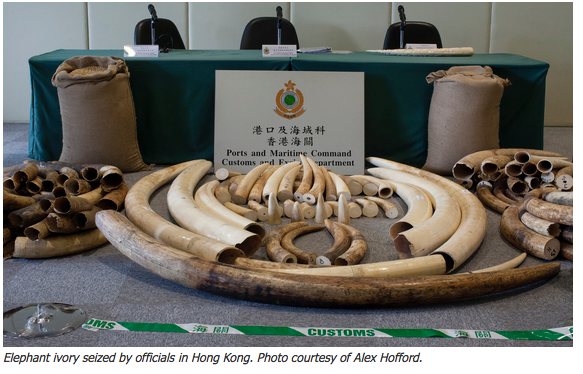 Elephant ivory seized by officials in Hong Kong. Photo courtesy of Alex Hofford. Voters in Washington state sent a strong message to the world on November 3 when they passed the country's first-ever comprehensive state ban on commerce in endangered animal species. The Washington Animal Trafficking Initiative 1401 (I-1401) prohibits the purchase, sale, and distribution of ten endangered species groups and their parts. It includes not only elephant ivory but also rhino horn, pangolin scales, the bones, skins and other parts of tigers, lions, leopards, and cheetahs, sea turtle eggs, meat, and shells, and fins from sharks and rays--all of which are all severely threatened by commercial trade. Passage of the law is also significant because it's the first time such a decision was put directly to the people through a ballot initiative. The ballot initiative not only expanded the scope of the earlier bill but passed by a landslide, garnering 70 percent of the vote and winning a clear majority in each of Washington's 39 counties. Such overwhelming popular support demonstrates the disconnect that often exists between public opinion and special interests, especially on the ivory trade issue. Earlier bills to regulate state ivory and rhino horn sales (HB 1131/SB 5241), introduced in the Washington legislature in January 2015, were met with fierce attacks from the National Rifle Association and others in the weapons lobby. They actively campaigned against a ban, saying it was put forth by "anti-gun elitists" and would punish law-abiding citizens. People had the idea the initiative "was an additional intrusion on their right to sport hunt in other countries," notes State Senator Christine Rolfes, one of the cosponsors of SB 5241. "But that wasn't what the initiative was about." The bill "had nothing to do with gun control," explains Sam Wasser, of the University of Washington's Center for Conservation Biology, who testified for it. Rather, he said, it dealt with "the illegal use of ivory for all kinds of products, and one of the illegal uses is carving it into the handles of guns. But because it was taken as another attempt for gun control, and misconstrued as that, legislators turned against it." The earlier ivory ban bill was watered down with so many exemptions, including one to allow sales of ivory trinkets, that it would have been ineffective. 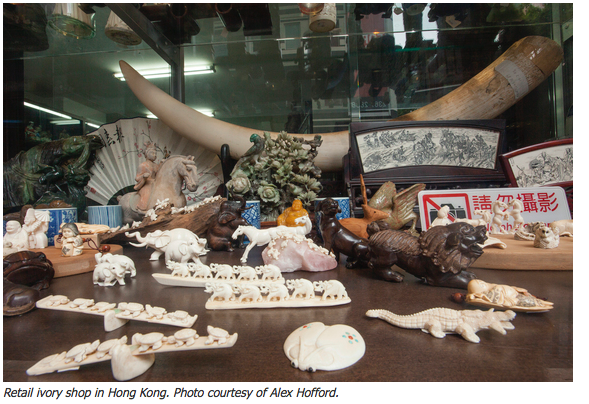 Retail ivory shop in Hong Kong. Photo courtesy of Alex Hofford. "We were all very disappointed when special interests ended up defeating the bill," recalls Jared Axelrod, senior government affairs associate at Vulcan, the umbrella company that oversees billionaire Paul Allen's investments and projects. Allen is an avid supporter of African elephant conservation and bankrolled Washington's initiative effort. "The bill was weakened beyond repair. It would've had a detrimental effect, worse than having no bill at all." That's when advocates decided to pursue a ballot initiative and ask the voters what they wanted. State laws normally go through the legislature, but a ballot initiative provides a safety valve and allows citizens to initiate legislation through a petition process. When it came time for a vote, I-1401 won by a huge margin--a rare occurrence. "Our state is very divided--East and West, Republican and Democrat, liberal and conservative," explained Sen. Rolfes. "But this bill was something that unified voters across the state. It had one of the highest percentages of yes votes than any initiative I can remember. It clearly was an issue that unified us." State Representative Joe Fitzgibbon, who cosponsored the earlier ivory ban bill, concurs. 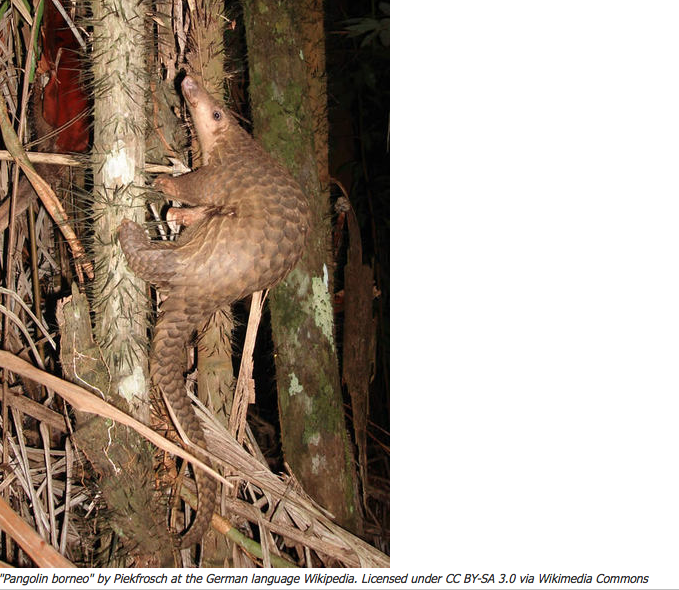 "It shows that protecting endangered species is not that controversial with the public. It might be controversial with the NRA, but most people, even in conservative parts of the state, want to protect animals from extinction." "It's a wake-up call to legislators, who may be responding to special interests in a way that's not in line with their constituents," says Fred Koontz, Woodland Park Zoo's Vice President of Field Conservation. This issue is apolitical. "If given the opportunity, people will speak out in support of changing laws so that animals can be with us forever." Washington's anti-wildlife trafficking initiative provides a model for other states that may be looking for an alternative strategy to pass their own ivory or other wildlife trade bans that may have been stymied by special interests. Many states failed to enact laws to combat wildlife trafficking in 2015. "It makes sense for initiatives to be placed on the ballot as in Washington, so citizens can take action to save endangered species from extinction while we still can," says Jen Samuel, president of Elephants DC, a volunteer nonprofit working to end the ivory trade worldwide. 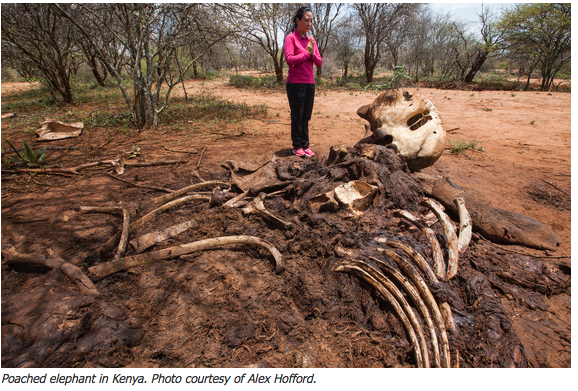 Poached elephant in Kenya. Photo courtesy of Alex Hofford. Getting an initiative on the ballot "is a cumbersome and costly process--but high impact when it works," says Wayne Pacelle, president of The Humane Society of the United States, which is involved dozens of animal-related ballot initiatives. "A single major win on a ballot measure can trigger legislative action in other states." 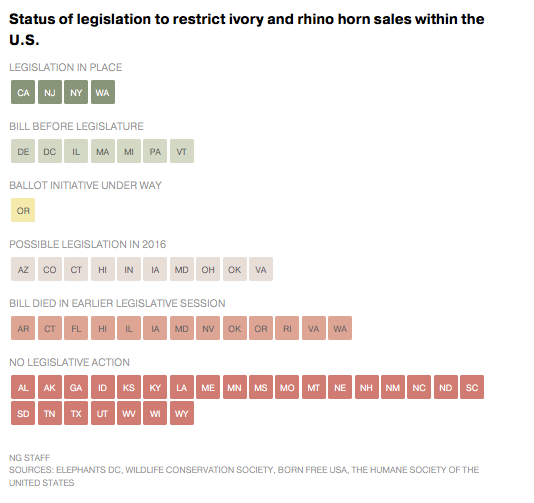 And a survey in Massachusetts conducted in mid-October by The Humane Society of the United States showed that 87 percent of voters favored legislation to ban prohibit the sale of ivory and rhino horns. Currently, 24 states have a ballot initiative process, each with its own requirements and restrictions. Sometimes, just the threat of an initiative is enough to get action. "I've seen that here in Washington," says Rep. Fitzgibbon. "Now that legislatures in other states have seen that voters resoundingly support an initiative like this, maybe they'll be more likely to take it on themselves." This is an excerpt of an article that originally appeared on National Geographic and is posted with permission. You can see the full story here. View this article on Huffington Post.